Longtime SEGA mascot Sonic the Hedgehog has had his own comic book since his first four-issue miniseries debuted in 1992. That 4-part series, published by Archie Comic Publications, Inc., would eventually earn a Guinness World Record in 2008 for the longest-running comic book based on a video game. 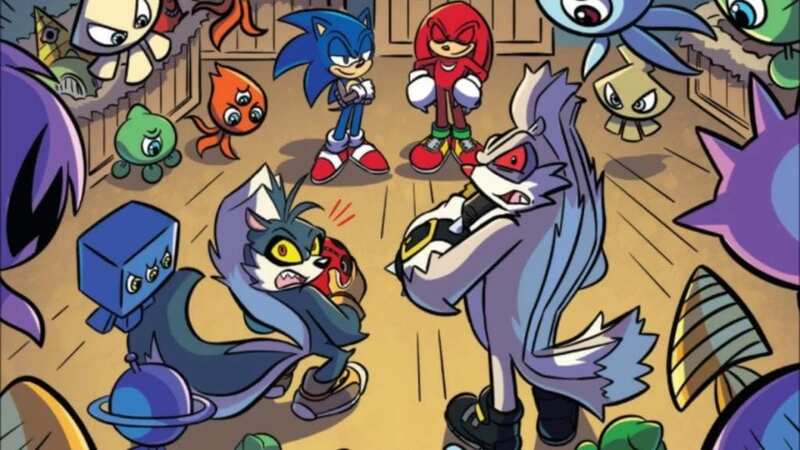 The series would reach 290 issues, not counting 48-page specials and spin-off series such as Knuckles the Echidna, before being canceled in July 2017. 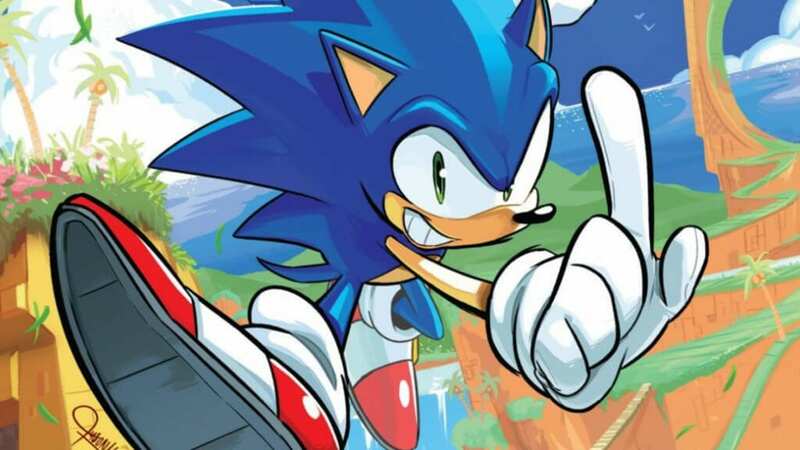 The cancellation of the historic comic book run was the consequence of an amalgam of lawsuits filed by former series writer Ken Penders, and SEGA resolving to annul its business partnership with the comic book publisher. The abolition of the Archie-published Sonic series was remorsefully something that long-time fans, such as myself, had seen coming. Archie’s Sonic the Hedgehog had been on a downward trend for a number of years since its hallmark 50th issue that showed the end of Sonic and his fellow Freedom Fighters’ conflict against the tyrannical Doctor Robotnik. And while several strong stories were released afterward, the issues leading up to, and including, the milestone 100th issue were universally vilified as narrative and artistic waste (o, to borrow a term from Geeks and Gamers friend and uncle Ethan Van Sciver, “Garbage tier”). Archie Comics suffered heavily from a lack of good writers with a unified direction for where the story should be going, and from a lack of proper artistic talent where the series’ pencils were concerned. This was an unfortunate situation given the wealth of talented artists that had contributed to the comic: Patrick “Spaz” Spaziante, Steven Butler, Jeff “Jay” Axer, and Dawn Best were among the short list of excellent contributors to the series over the years. And despite a series reboot that brought not only quality writing by Ian Flynn, but also great pencils by Tracy Yardley, the damage had been done, and SEGA concluded their business with Archie. Although fans had seen the writing on the wall, Sonic Maniacs still wanted to follow the adventures of their favorite “Blue Blur,” and they got their wish when publisher IDW announced on their Twitter in July 2017 (the same month in which Archie’s contract had been terminated) that they had sealed a deal with SEGA to begin a new series of Sonic comic books aptly titled Sonic the Hedgehog. Beginning with a four-part release mirroring the original miniseries from Archie, IDW set out to release one issue each week in April 2018 before turning to a regular monthly release schedule. As if to quell fan trepidations regarding the new series, IDW latterly announced that they would have recent Archie Sonic writer Ian Flynn penning the series’ narrative and that his partner in crime, equally recent Sonic artist Tracy Yardley, would be joining a team of regular artists for the new book. To that end, the series would be off to a running start with each of those first four issues selling out immediately and leaving comic shop owners rushing to order more. The one-million-magic-rings question is: is IDW’s Sonic the Hedgehog any good? As someone who’s very first comic book purchase was an Archie Sonic comic (I have all the way back to issue #0 in my collection), I can start by telling you that IDW did well to bring Ian Flynn onboard. Flynn’s penchant for telling more back-to-basics Sonic stories is what the character needed for this new run. The story’s opening issue picks up in the aftermath of Sonic’s most recent conflict against franchise villain Dr. Eggman. Following our hero’s climactic battle with the not-so-good doctor (seemingly after Sonic Forces, although the canonicity is in question), the round would-be ruler vanished without a trace. In the weeks that followed, Sonic and the rest of the resistance, led by Knuckles the Echidna, Amy Rose, and Miles “Tails” Prower, have been attempting to clean up the fallout of their victory by traveling from village to village and destroying the disorganized remnants of Dr. Eggman’s robot army along the way. This all brings us to the present day, where we find Sonic racing toward a small town that is being assaulted by Eggman’s badniks. As he always does, Sonic saves some helpless citizens who are fleeing for their lives just in time, quickly mopping up all of the small robots with a flash of style and attitude mixed in. Just as our azure hero thinks he’s finished his work here, however, he’s nearly transformed into Sonic the Pancake by a quartet of massive, mallet-wielding super badniks, but Tails swoops in and lifts Sonic out of danger in the nick of time. The duo proceeds to face down the super badniks and, after some quick tag-team thinking, make short work of the assailing robots via some great action pencils by Tracy Yardley. The two then wonder aloud if something else is behind these attacks, as this last assault appeared to be far more coordinated than that of broken and defeated forces, with Tails observing that it would be opposite Eggman’s usual modus operandi to make a return “without so much as an angry vlog,” but that the lack of maniacal fanfare is indeed unsettling at the very least. Leaving Tails to assist the remaining villagers with repairs to their defenses, Sonic races off in search of answers, and we see the image of a not-so-inconspicuous-looking throne, bearing the sigil of the Eggman Empire on its back, observing a tracked Sonic on-screen in front of it. The second issue of Sonic the Hedgehog starts in a similar manner, with Sonic squaring off against yet another massive super badnick, this one resembling a robotic crab. Issue #2’s pencils are done by Adam Bryce Thomas, and he brings stylized visuals that stand out from the rest of these first four issues. As Sonic wraps up his battle with the crumbling metal husk, Amy Rose arrives on the scene, pleading with Sonic to return to the resistance and help them mount a counter-offensive against Eggman’s increasingly crafty forces. Sonic declines the entreaty and the two begin to argue over the merits of him returning to the group or continuing his solo reconnaissance and strike missions. The lover’s spat is interrupted by one of the townspeople shrieking that a robot army is invading from west of the town. The two hedgehogs split up, with Amy Rose directing the town’s small militia and ensuring the safety of the remaining citizens while Sonic runs interference and does what he does best by busting badniks. Similar to the Sonic and Tails team-up of the first issue, Amy then joins Sonic by using her Piko-Piko Hammer to obliterate baddies alongside her long-time crush, and we get to see some inventive use of the pair in combat. Relenting that she’s not going to be successful in recruiting Sonic back to the resistance, Amy offers to seek out Knuckles, whose last known location was in another town to the south of their position. The third act opens with Sonic arriving at a walled city just in time to witness his friendly nemesis Knuckles knocking the nuts and bolts out of a super badnik. Something that I noticed immediately was a drop in the artistic detail from the first two issues to this one, and I felt that Jennifer Hernandez’s pencils and Heather Breckel’s colors felt flat when compared with the rest of this 4-parter. They’re not bad by any means, but I was looking for something different. Upon exchanging a few friendly quips before ascending the city walls and making their way inside, Sonic & Knuckles hear from the townsfolk that they’ve been held against their will by a pair of mercenaries. Making their way into the mercs’ hideout, where it is discovered they’ve been stockpiling and hoarding Wisp weapons (a.k.a. Wispons – cut me some slack, I didn’t come up with it), the heroes confront the mercenaries, who turn out to be a pair of ludicrously comedic goofballs named Rough and Tumble. Their Ginyu Force-esque pose puts Sonic in tears and nearly sends him to the floor in laughter before he and Knuckles charge the court jesters, making short work of the clowns with the help of the liberated Wisps. With Rough & Tumble now under arrest and the townsfolk once again armed with the power of the willing vanguard of Wisps, the brothers in arms celebrate their victory with the town. Keeping in line with the prior three issues, the fourth act of Sonic the Hedgehog opens with Sonic racing towards a city on a hill that is under assault by an army of Dr. Eggman’s robots and an enormous hornet-like super badnik that looms overhead. Inside, Sonic bears witness to what’s left of the town desperately struggling against their maniacal, mechanical assailants, and encounters one lone rebel fighting back with some level of success. The young girl, who skillfully holds her own by use of her long, prehensile tail, introduces herself as Tangle the Lemur. The new acquaintances team up and do some serious tandem badnik-busting. Their duo effort proves successful until a pair of enormous super badniks arrive and box them in the center of a courtyard as smaller badniks began to surround them. Realizing that they will have to step up their game to achieve victory, they brace themselves for the coming battle, but before they can make their move an obelisk of flame engulfs the lot of the badniks, taking Sonic and Tangle by surprise. The Old Testament display is manifested by Blaze the Cat, a former ally, and friend of Sonic’s. After brief introductions between the violent, violet feline and the limber lemur, the trio teams up and goes on a badnik-bashing spree throughout the city, culminating in Tangle tail-launching Sonic and Blaze into the sky to reduce the overhead hornet super badnik to a glorious blazing ball of fire. Sonic takes off to continue his solo missions and our final panels reveal the nefarious Dr. Eggman snickering from behind shuttered curtains. Evan Stanley’s pencils paired with Sonic colors veteran Matt Herms bring life back to the series in this fourth issue. So is IDW Publishing’s Sonic the Hedgehog good? Ian Flynn’s foundational writing sets this reboot out on the right foot. The story maintains the personalities of the characters that he already has ample experience with penning from his years with Archie, and, more importantly perhaps, the interactions between the characters feel right. The story isn’t anything mind-blowingly deep, but c’mon; this is Sonic the Hedgehog, not Green Lantern Rebirth – it necessitates a certain degree of simplicity, at least from the outset. Hook the readers with something readable and enjoyable to look at, to which end Tracy Yardley’s pencils do stupendously (and I would be remiss to say nothing of the other fine line work), and then you can add layers onto that strong foundation. If IDW continues along this path with their Sonic the Hedgehog run, then the character will receive some much-deserved revitalization. As they continue to add more fan-endeared characters from the beloved universe with each subsequent issue, they can count on this comic to be a grand, multifaceted Master Emerald for the franchise. IDW's decision to enlist the talents of those who have formerly worked on the Archie Sonic comics was wise in that it gives readers something familiar to start off with. Longtime Sonic Maniacs will feel right at home with the pacing and artwork. Ian Flynn's writing starts off the series strong, although if you're looking for a deep narrative you're in the wrong place.